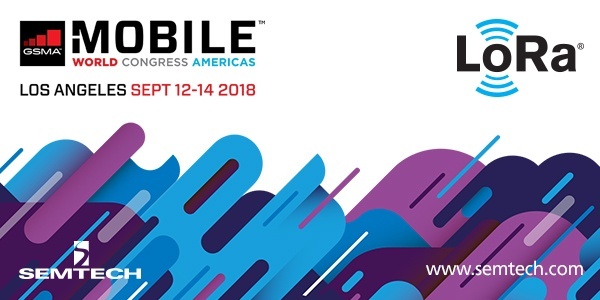 The North American installment of GSMA’s Mobile World Congress conference will be held in Los Angeles, September 12-14, 2018. This year’s event theme, “Imagine a Better Future,” is an inspiring rally cry for the 25,000 expected attendees representing more than 110 countries, coming together to explore what’s new in Internet of Things (IoT) and smart city innovation. 1. Members of the LoRa Alliance™ will assemble in the IoT Zone at South Hall Stand 2524 to present a sampling the latest and greatest in LoRa Technology innovation. Actility will showcase ThingPark Wireless, a leading LoRaWAN-based network management solution and the power behind over 50 of the large-scale and national low power wide area network (LPWAN) operator rollouts worldwide, and demonstrate ThingPark Exchange, a LoRaWAN roaming hub enabling global network access, multi-country network connectivity use cases and support for multinational customers. Actility will also be featuring solutions for dedicated enterprise IoT networks, and out-of-the-box solutions for a wide range of industrial IoT applications from cold-chain assurance to factory air quality monitoring and asset geolocation and tracking. Digital Matter will present its battery powered, LoRaWAN-based tracking devices, including the Oyster, the Guppy, and Yabby. Digital Matter’s SensorData and SensorNode products offer sensor interfaces for temperature, humidity and soil moisture, all viewable on Digital Matter’s software platform, Telematics Guru. In the LoRaWAN Live Demo Zone, Everynet will feature its versatile LoRaWAN-based end-device reference design “TouchTAG” in a variety of monitoring and tracking use cases. The TouchTAG reference design is a demonstration that small, low cost and long-battery-life devices are feasible now. Guangdong DAPU Telecom Technology Co.’s live demo of LoRaWAN technology will create a network environment encompassing modules with LoRa Technology to a sensor node, LoRaWAN-based gateway and Cloud server. Dapu will demonstrate its LoRa-based modules, temperature and humidity sensor nodes, GPS sensor node, infrared sensor node, smoke sensor node, gas meter, LoRaWAN gateway, and Cloud platform. Haxiot, also in the LoRaWAN Live Demo Zone, will showcase its entire end-to-end device-to-cloud portfolio including client modules, gateways and highly scalable X-ON Cloud IoT Platform. Its fully-integrated system has proven to reduce time to market for IoT solutions the cost of deployment. Advanced features of the X-ON IoT platform have enabled applications in many industries including smart lighting, smart utility, smart building and asset tracking, etc. Haxiot will demonstrate a real-world smart city application, an urban smart bike. Kerlink (also exhibiting independently in Hall South Stand S.2556) is a [global leading][leading global] provider of end-to-end network solutions for the Internet of Things (IoT), serving telecom operators, businesses and public authorities worldwide. Its growing suite of turnkey IoT services includes network planning, design and operational management that maximizes performance of its market-leading, carrier-grade infrastructure offerings. Kerlink Group, widely recognized for its IoT expertise, also continually introduces innovative value-added services, such as network-based geolocation, remote end-device management and low-power IoT reference design, which allows its customers to quickly bring to market IoT-ready devices and to imagine innovative business models to monetize their deployments. Longview, a Carnegie Technologies company, provides LoRaWAN-based hardware and software solutions that deliver business results in construction, oil & gas, smart cities, and other industries. In the LoRaWAN live demo zone, Longview will showcase a money-saving demonstration of tracking people, tools, and vehicles in an industrial construction site for an oil & gas refinery. Microshare will provide a live demo of its state-of-the-art Space Utilization solution. In real-time, the IoT solution will show the volume of visitors to the LoRa Alliance booth who receive product demos from a number of exhibiting solutions providers. This solution is currently being used to produce insights into space utilization for the world’s largest and most prestigious property managers and facilities management providers. The demo consists of an end-to-end IoT solution, with battery-operated sensors installed onsite, a LoRa IoT gateway running onsite, live network connectivity and running app. myDevices, also in the LoRaWAN™ Live Demo Zone, will showcase its industry-leading IoT in a Box™ turnkey LoRaWAN-based commercial refrigeration and facility monitoring solutions. Demonstrations will show how the facility management solution protects important assets for small businesses and enterprises across a wide variety of verticals. Demonstrations will show how easy it is to connect pre-configured LoRaWAN-enabled gateways and sensors using the mobile app. Featured sensors will include motion, door, open/close, water leak, and mouse trap. Orbiwise will be showcasing a live end-to-end LoRaWAN-based network centered around its industry leading Network Server, OrbiWANTM, and utilizing its newly launched Noise Pollution Solution (sensor + application). The Noise Pollution Solution measures and reports noise levels over time - allowing businesses, cities and other entities to locate problems areas for public safety, regulatory, abnormal episodes and other monitoring events. Semtech will demonstrate the LoRa Tag™ and LoRa-enabled solutions that improve daily challenges, featuring a solution for commercial water management. In one example, a global corporation reduced operating costs and saved 22% on water usage upon evaluating their usage data. The LoRaWAN-based IoT solutions are quickly integrated into existing infrastructures to solve a number of key issues in metering, smart home management, smart agriculture, and cities. Senet will be partnering with several event sponsors and exhibitors to demonstrate applications running on its global LoRaWAN-based network. Senet recently announced enhancements to its LoRaWAN connectivity platforms resulting in expanded coverage to more than 80 countries (see map), and simplified deployment, management and monetization of LPWANs and applications. The company was also recently awarded IoT Evolution Magazine Product of the Year for its LVN—an incentive-based ‘Connectivity Marketplace’ where CSPs, IoT infrastructure providers, solution providers and system integrators partner with Senet to deploy low-cost LoRaWAN gateways and immediately benefit from revenue-share models based on their contribution to the network buildout. Tektelic Communications, exhibiting in Hall South Stand S.3016 is a recognized supplier of best-in-class LoRaWAN-based IoT gateways, sensors and custom applications. With a growing portfolio of products, Tektelic has solutions available in all global ISM frequency bands and its products can address a wide variety of vertical applications and deployment conditions. Ubicquia, exhibiting at Hall South Stand S.2150 , oﬀers municipalities, utilities, broadband service providers, and lighting manufacturers a cost-effective and expandable platform for deploying simply connected, simply smart broadband, small cell and smart city services. Its plug-and-play network has the ability to turn any street light into a multi-function router that supports a growing list of services that includes advanced lighting controls, public Wi-Fi, and the connection to 3rd party sensors including air quality monitors and surveillance cameras. Ubicquia will participate in the MWCA Sustainable Smart Cities tour, highlighting diverse examples of cities leveraging their technology investments to advance the UN’s Sustainable Development Goals. The tours will take place once each day of the show. The 3:45 PM session in Gold Ballroom 1 is part of the IoT 101 – Digital Transformation University tract presented by James Brehm & Associates. The panel session promises to explore the challenge of selecting the right connectivity platform depending on the use case, and navigating the alphabet soup of IoT. Furthermore, the panelists will discuss the future of network interoperability in heterogeneous network (HetNet) environments. In preparation for the session you can read a recent blog on selecting the IoT platform for LPWAN applications. 4. Thursday night, Semtech will co-host a cocktail party with Comcast’s IoT service, machineQ, at the Grammy Museum at L.A. Live. The party will celebrate the IoT’s rising star, LoRa Technology, and bring together VIPs for an evening of networking and entertainment. The party is by invitation only, so contact your machineQ or Semtech representative for details. Not planning to attend Mobile World Congress Americas this year? You can still meet the LoRa ecosystem online. Visit our website!